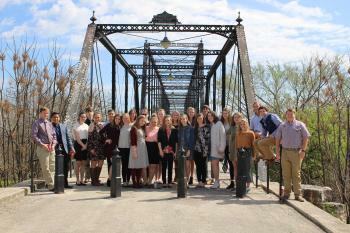 The Youth Leadership New Braunfels Class of 2018 will hold its final class session on April 10. The class members will be honored at a graduation dinner and program at 6:00 p.m. on Thursday, April 12 at Seekatz Opera House. The evening will include catered dinner, video presentation of the class year, words from class members, award presentations and keynote speaker CEO of New Braunfels Utilities Ian Taylor. The graduating class of 29 sophomores and juniors includes 10 students from Canyon High School, three students from St. John Paul II Catholic High School, one student from New Braunfels Christian Academy, two students from Memorial Early College High School, and 14 students from New Braunfels High School. More than 600 young leaders have completed the Youth Leadership program during its 21 years. Join us at this event for your opportunity to meet these 29 outstanding young men and women and see firsthand how they have progressed and matured in the past year through the Youth LNB program. Tickets are available at www.LeadInNewBraunfels.com for $22. Graduation sponsors include: Bluebonnet Motors and M&S Engineering.